James Mickens  is explaining how comedians Hannibal Buress and Louis C.K. get their laughs: Buress’s high “joke density” versus Louis C.K.’s slow-build storytelling. For Mickens, an associate professor of computer science known for his snappy, engaging, and laugh-out-loud funny PowerPoint presentations on computer security (many viewable online), YouTube comedy clips are research. “A lot of people don’t realize that even the sciences are a social field,” he says. “When you can explain your work well and create a narrative, you are building a universe for people to inhabit with you.” He approaches teaching the same way. Mickens joined Harvard’s faculty last fall, after six years with Microsoft Research and a one-year visiting professorship at MIT. He tries to give his students a “deeper sense of the work,” he says, beyond money and prestige and Silicon Valley. 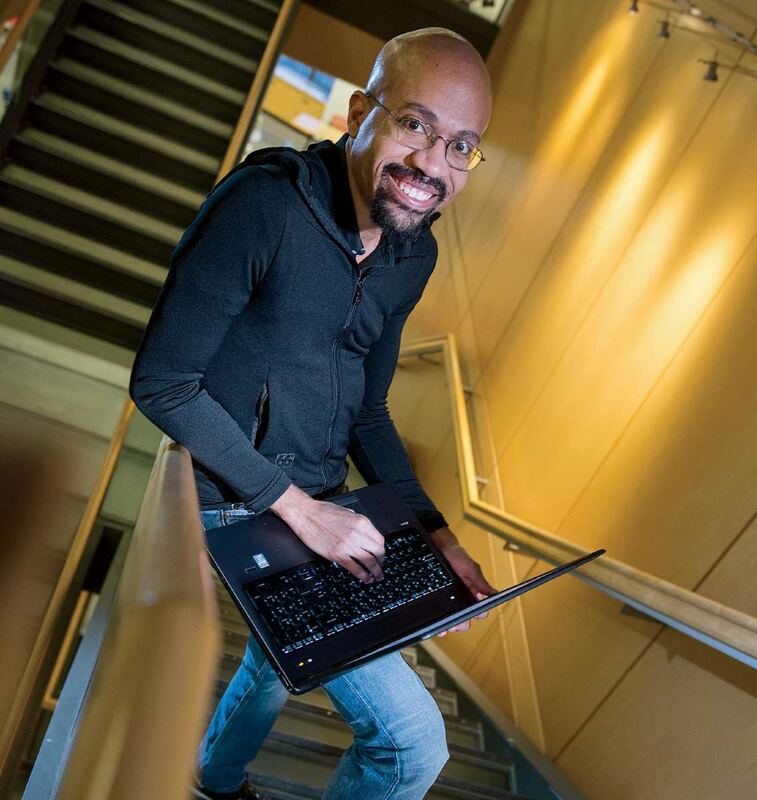 Growing up in Atlanta as a physicist’s son (and a serious heavy metal fan; he owns a formidable record collection and plays in two one-man bands), he was drawn to computer science and the potential to “build things with your mind, without needing a backhoe. There’s a lot of architectural thought, and yet at a certain level you’re in a different reality.” After Georgia Tech, and a Ph.D. from the University of Michigan, he now studies security—or the lack of it—in distributed systems (multiple computers connected to a network). A lot of his research, he says, “is thinking about failure scenarios.” It also addresses the fundamental tension between privacy and profit in Web services like Facebook and Gmail. He’s working on a data-storage system that would allow users to retain control of their online content—and a whole new ecosystem of Web services to go with it. Building without a backhoe.